All attempts to adapt our ethical code to our situation in the technological age have failed. My Life & My Views (1968), 52. Letter to Heinrich Zangger (Dec 1917), Collected Papers Vol. 8, 412, as cited in Jürgen Neffe, Einstein: A Biography (2007), 256. Arguably the greatest technological triumph of the century has been the public-health system, which is sophisticated preventive and investigative medicine organized around mostly low- and medium-tech equipment; ... fully half of us are alive today because of the improvements. In Visions of Technology (1999), 22. As agonizing a disease as cancer is, I do not think it can be said that our civilization is threatened by it. … But a very plausible case can be made that our civilization is fundamentally threatened by the lack of adequate fertility control. Exponential increases of population will dominate any arithmetic increases, even those brought about by heroic technological initiatives, in the availability of food and resources, as Malthus long ago realized. From 'In Praise of Science and Technology', in Broca's Brain: Reflections on the Romance of Science (1975, 2011), 43. As nuclear and other technological achievements continue to mount, the normal life span will continue to climb. The hourly productivity of the worker will increase. But as a philosopher said, one day after mastering the winds, the waves, the tides and gravity, after all the scientific and technological achievements, we shall harness for God the energies of love. And then, for the second time in the history of the world, man will have discovered fire. Speech accepting nomination as candidate for vice president, Democratic National Committee, Washington, D.C. (8 Aug 1972) as reported in New York Times (9 Aug 1972), 18. Shriver slightly paraphrased the similar sentiment written in 1934 by Pierre Teilhard de Chardin, translated by René Hague in 'The Evolution of Chastity', Toward the Future (1975), 86-87. But of all environments, that produced by man’s complex technology is perhaps the most unstable and rickety. In its present form, our society is not two centuries old, and a few nuclear bombs will do it in. To be sure, evolution works over long periods of time and two centuries is far from sufficient to breed Homo technikos… . The destruction of our technological society in a fit of nuclear peevishness would become disastrous even if there were many millions of immediate survivors. The environment toward which they were fitted would be gone, and Darwin’s demon would wipe them out remorselessly and without a backward glance. Asimov on Physics (1976), 151. Also in Isaac Asimov’s Book of Science and Nature Quotations (1988), 181. By virtue of the way it has organized its technological base, contemporary industrial society tends to be totalitarian. For 'totalitarian' is not only a terroristic political coordination of society, but also a non-terroristic economic-technical coordination which operates through the manipulation of needs by vested interests. It thus precludes the emergence of an effective opposition against the whole. Not only a specific form of government or party rule makes for totalitarianism, but also a specific system of production and distribution which may well be compatible with a 'pluralism' of parties, newspapers, 'countervailing powers,' etc. One Dimensional Man (1964), 3. From My Own Story (1957), 320. Engineering is not merely knowing and being knowledgeable, like a walking encyclopedia; engineering is not merely analysis; engineering is not merely the possession of the capacity to get elegant solutions to non-existent engineering problems; engineering is practicing the art of the organizing forces of technological change ... Engineers operate at the interface between science and society. In Bert Scalzo, et al., Database Benchmarking: Practical Methods for Oracle & SQL Server (2007), 37. Historically, science has pursued a premise that Nature can be understood fully, its future predicted precisely, and its behavior controlled at will. However, emerging knowledge indicates that the nature of Earth and biological systems transcends the limits of science, questioning the premise of knowing, prediction, and control. This knowledge has led to the recognition that, for civilized human survival, technological society has to adapt to the constraints of these systems. As quoted in Chris Maser, Decision-Making for a Sustainable Environment: A Systemic Approach (2012), 4, citing N. Narasimhan, 'Limitations of Science and Adapting to Nature', Environmental Research Letters (Jul-Sep 2007), 2. I have turned my attention from technological progress to life, from the civilized to the wild. In Autobiography of Values (1976), p. 358. From Surely You’re Joking, Mr. Feynman! : Adventures of a Curious Character (1985), 51. In 1891, during the Presidency of William Henry Harrison [Benjamin Harrison], electric lights were first installed in the White House, the residence of the leaders of our country. At that time, commercial electricity was not economically feasible, but President Harrison wanted to affirm his confidence in the technological capability of our country. In the modern world, science and society often interact in a perverse way. We live in a technological society, and technology causes political problems. The politicians and the public expect science to provide answers to the problems. Scientific experts are paid and encouraged to provide answers. The public does not have much use for a scientist who says, “Sorry, but we don’t know.” The public prefers to listen to scientists who give confident answers to questions and make confident predictions of what will happen as a result of human activities. So it happens that the experts who talk publicly about politically contentious questions tend to speak more clearly than they think. They make confident predictions about the future, and end up believing their own predictions. Their predictions become dogmas which they do not question. The public is led to believe that the fashionable scientific dogmas are true, and it may sometimes happen that they are wrong. That is why heretics who question the dogmas are needed. 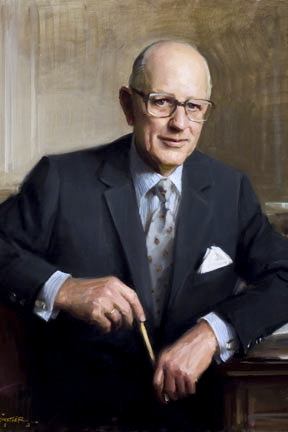 Frederick S. Pardee Distinguished Lecture (Oct 2005), Boston University. Collected in 'Heretical Thoughts About Science and Society', A Many-Colored Glass: Reflections on the Place of Life in the Universe (2007), 43-44. Most of the dangerous aspects of technological civilization arise, not from its complexities, but from the fact that modern man has become more interested in the machines and industrial goods themselves than in their use to human ends. In A God Within (1972). Our attention will focus on the institutional context of technological innovation rather than … individual inventors, for the actual course of work that leads to the conception and use of technology always involves a group that has worked for a considerable period of time on the basic idea before success is achieved. In The Social Context of Innovation: Bureaucrats, Families, and Heroes in the Early Industrial Revolution as Foreseen in Bacon’s New Atlantis (1982, 2003), 3. 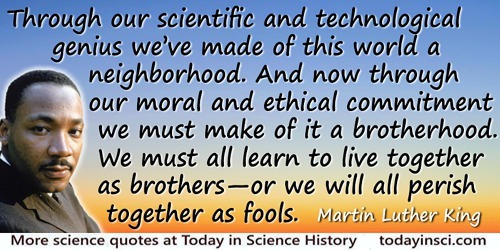 Science through its physical technological consequences is now determining the relations which human beings, severally and in groups, sustain to one another. If it is incapable of developing moral techniques which will also determine those relations, the split in modern culture goes so deep that not only democracy but all civilized values are doomed. In Freedom and Culture (1939). Since we have no choice but to be swept along by [this] vast technological surge, we might as well learn to surf. in David Western and Mary C. Pearl, Conservation for the 21st Century (1989). In Ends and Means: An Inquiry Into the Nature of Ideals and Into Methods (1937), 9. The economic and technological triumphs of the past few years have not solved as many problems as we thought they would, and, in fact, have brought us new problems we did not foresee. In 'Henry Ford on What’s Wrong With the U.S.', U.S. News & World Report (1966), 60, 24. The engineer is the key figure in the material progress of the world. It is his engineering that makes a reality of the potential value of science by translating scientific knowledge into tools, resources, energy and labor to bring them to the service of man ... To make contribution of this kind the engineer requires the imagination to visualize the needs of society and to appreciate what is possible as well as the technological and broad social age understanding to bring his vision to reality. In Philip Sporn, Foundations of Engineering: Cornell College of Engineering Lectures, Spring 1963 (1964), 22. The first atomic warhead I saw was … like a piece of beautiful sculpture, a work of the highest level of technological skill. It’s the point of a spear. In Raymond Mungo, 'Dixy Lee Ray: How Madame Nuke Took Over Washington', Mother Jones (May 1977), 2, No. 4, 40. The great testimony of history shows how often in fact the development of science has emerged in response to technological and even economic needs, and how in the economy of social effort, science, even of the most abstract and recondite kind, pays for itself again and again in providing the basis for radically new technological developments. In fact, most people—when they think of science as a good thing, when they think of it as worthy of encouragement, when they are willing to see their governments spend substance upon it, when they greatly do honor to men who in science have attained some eminence—have in mind that the conditions of their life have been altered just by such technology, of which they may be reluctant to be deprived. In 'Contemporary World', Bulletin of the Atomic Scientists (Feb 1948), 4, 67. The open society, the unrestricted access to knowledge, the unplanned and uninhibited association of men for its furtherance—these are what may make a vast, complex, ever growing, ever changing, ever more specialized and expert technological world, nevertheless a world of human community. 'Science and the Common Understanding' (1954), 95. Reprinted in John Dewey and Julius A. Sigler, Classical Selections On Great Issues, Vol. 8, Science, Technology, and Society (1997), 35. Opponents of fission energy point out a number of differences between the real world and the “technological paradise.” ... No acts of God can be permitted. 'Energy and Environment', Bulletin of the Atomic Scientists (May 1972), 6. The way to solve the conflict between human values and technological needs is not to run away from technology, that’s impossible. The way to resolve the conflict is to break down the barriers of dualistic thought that prevent a real understanding of what technology is—not an exploitation of nature, but a fusion of nature and the human spirit into a new kind of creation that transcends both. In Zen and the Art of Motorcycle Maintenance (1974). The world has changed far more in the past 100 years than in any other century in history. The reason is not political or economic but technological—technologies that flowed directly from advances in basic science. 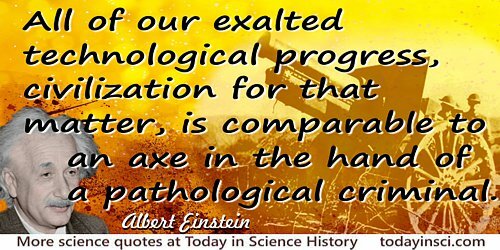 Clearly, no scientist better represents those advances than Albert Einstein: TIME’s Person of the Century. 'A Brief History of Relativity'. Time (31 Dec 1999). There is a demon in technology. It was put there by man and man will have to exorcise it before technological civilization can achieve the eighteenth-century ideal of humane civilized life. A God Within (1972), 216. We are too prone to make technological instruments the scapegoats for the sins of those who wield them. 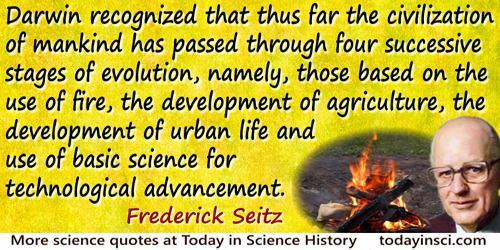 The products of modern science are not in themselves good or bad; it is the way they are used that determines their value. Acceptance speech for an honorary degree from the University of Notre Dame. In Marshall McLuhan, Understanding Media: the Extensions of Man? (2nd Ed.,1964), 11. Without any remaining wilderness we are committed wholly, without chance for even momentary reflection and rest, to a headlong drive into our technological termite-life, the Brave New World of a completely man-controlled environment. We need wilderness preserved—as much of it as is still left, and as many kinds—because it was the challenge against which our character as a people was formed. Letter (3 Dec 1960) written to David E. Pesonen of the Outdoor Recreation Resources Review Commission. Collected in 'Coda: Wilderness Letter', The Sound of Mountain Water: The Changing American West (1969), 147. Working on the final formulation of technological patents was a veritable blessing for me. It enforced many-sided thinking and also provided important stimuli to physical thought. Academia places a young person under a kind of compulsion to produce impressive quantities of scientific publications–a temptation to superficiality. Farewell Address as U.S. President (1961). In Diane Ravitch, The American Reader (2000), 538. [W]e might expect intelligent life and technological communities to have emerged in the universe billions of years ago. Given that human society is only a few thousand years old, and that human technological society is mere centuries old, the nature of a community with millions or even billions of years of technological and social progress cannot even be imagined. ... What would we make of a billion-year-old technological community? In Are We Alone? (1995), 48.